Cuando Bahaus fue clausurado por los Nazis en 1933, muchos de estos estudiantes emigraron o retornaron a Tel Aviv. Hoy, los 2700 edificios modernistas diseñados por esa generación son descuidados o no gustan a los residentes por sus linea de ascendencia germánica, a pesar de estar catalogado como patrimonio de la humanidad por la Unesco. When the Bauhaus was closed by the Nazis in 1933, several of its students emigrated or returned to Tel Aviv. Today, the 2,700 modernist buildings are neglected or disliked by residents for their Germanic straight lines, despite the UNESCO World Heritage Status the city has been granted. Uno de las principales decisiones arquitectonicas por los emigrantes de Bahaus fue poner balcones en los frontales de sus nuevas torres de casas en lugar de en las partes traseras. 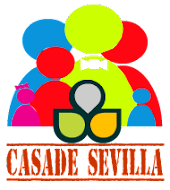 Cansados de esconderse Judios de centro europa ponen su vida social en abierto. El primer piso fue construido ensima de una serie de columnas, presentando una entrada retranqueada. Ron Arad se crió en Tel Aviv y recuerda que «todas los juegos de escondites fueron hechos debajo de estos edificios. El rasgo característico de Tel Aviv fue su reacción a la represión mas que en otros lugares cuyo Museo del Diseño en la cercana ciudad de Holón se abre en febrero de 2010. One of the main architectural decisions by the Bauhaus émigrés was to put the balcony on the front of their new town houses rather than at the rear. Tired of hiding themselves, Mittel European Jews put their social life in the open. The first storey was built on top of a series of columns, providing a recessed entrance.Ron Arad, whose Design Museum in the nearby town of Holon opens in February 2010, grew up in Tel Aviv and remembers that ‘all the hide and seek games were played under buildings.’ Tel Aviv’s characteristic feature was a reaction to repression elsewhere. Today, Tel Aviv still defines itself in opposition to other places. The Israeli novelist and screenwriter Etgar Keret believes the beach is key to the city’s otherness. ‘The beach is also the most democratic place in Israel. As soon as everyone takes their clothes off, the old categories of rich/poor, or soldiers/Arabs, disappear.’ With its clubs and bars, its art galleries and its shops full of design trinkets, Tel Aviv defines itself as an opposite to conflict. Only now it is an opposite to the rest of Israel’s own highly militarised, non-secular state apparatus. Holon, they tell you, is not a suburb of Tel Aviv. It has its own administration and its population is about 170,000. Indeed, if you look closely as you drive south east through the continuous urban sprawl towards Jerusalem and one leaves the Mediterranean and enters the Middle East, the sign that announces you are no longer in Tel Aviv but in Holon marks this distinction. Many inhabitants of Tel Aviv know the area from taking their driving test there. (Particularly Ron Arad. He took his test six times in the streets of the town before he passed.) It expanded rapidly in the 1990s with immigrants from the former Soviet Union and therefore has a high tax yield. In addition, its mayor since 1993, Moti Sasson, is a progressive. When he took office, the Center for Technological Education was a small institution of 400 students affiliated to Tel Aviv University. By 2007 it was the independent Holon Institute of Technology with 5,000 students. 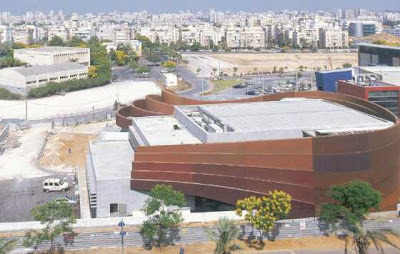 Adjacent to Arad’s building is the Holon Mediatheque, also built under Sasson’s instruction, which contains a library, a theatre and a cinema as well as the Israeli Design Center and, impressively, iMatter, a materials library for design students. Admirable though the Mediatheque’s programme is, it is an ugly building – a collage of daft stylistic twitches of American postmodernism: portholes, cranked columns, canopies pointlessly cantilevered over covered spaces. It’s even got a buttress or two. Around it are a series of 10- to 14- storey luxury apartment blocks; with one particularly unpleasant neighbour boasting bands of convex blank entablature between its balconies. 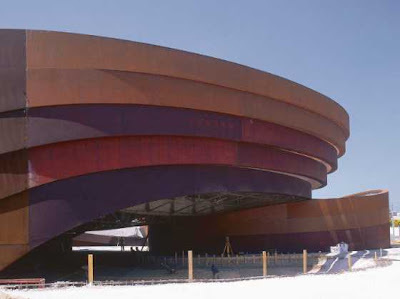 In response, Arad’s building is huddled and low, its bands of Cor-Ten steel acting as a cloak from the glare around it. Arad has created a building that stands in opposition to the world around it. The architect Seth Stein apparently called it a ‘rusty Guggenheim’ when he saw it. And, of course, there is a very deliberate parallel with Frank Gehry’s design for the Bilbao art gallery. 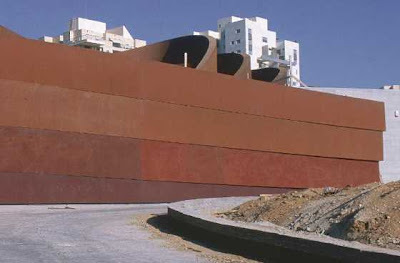 According to Arad the brief was for a building that could appear on a postage stamp; a building that would put Holon on the map the way that the Guggenheim did for Bilbao. In one way the comparison is pointless. The Guggenheim in Bilbao has over 11,000sq m of exhibition space, distributed throughout 19 galleries in a museum with a total floor space of 24,000sq m. Its construction budget was $100m. The Design Museum in Holon will have just 1,250sq m of exhibition space distributed over two galleries in a museum with a total floor space of 3,000sq m. Its construction budget was $15m (£9m), provided by the local authority. Not a whiff of national or international development funds. Yet in architectural terms there is an interesting comparison to make. Holon works in a way that Bilbao Guggenheim most clearly does not. With little legibility between the sculptural exterior and the interior galleries, Gehry’s building is a piece of floor-based art from the post-war period, scaled up to the size of a museum and then hollowed out to provide gallery space. 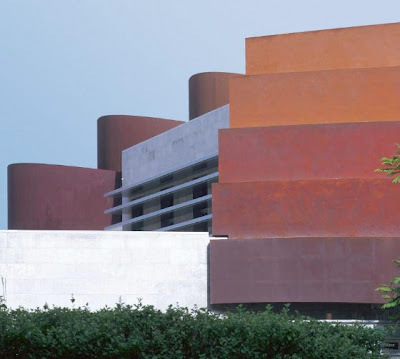 The Holon Design Museum’s bands of differently shaded Cor-Ten provide a means of reading the building inside and out. Yes, it is a one-liner, but the way the steel loops around the 200sq m lower gallery, creating a corridor and then forms the balustrade to the ramp up to the other level are just two of the moments of real architecture. 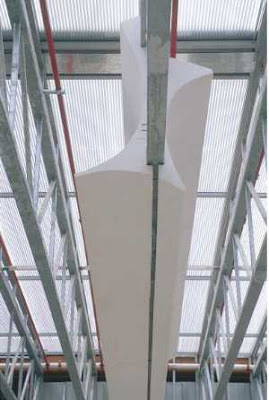 A 500sq m gallery above will also boast a vaulted ceiling made of polystyrene to allow natural and artificial light to be mixed, moderated and directed. Visitors to the Material Library will have a stunning example nearby of what you can do when you understand the logic of a material and then carry it to an architectural conclusion. The five steel bands wrap the two gallery spaces, leaving their east-facing facades open. In between these wider loops, the bands perform a figure of eight creating an amazing courtyard, which is partially occluded. As a visitor, one arrives at this through a cave that has been formed from the underside of the main gallery, which cantilevers over an entrance pathway and a landscaped area. Yigal Govrin, the no-nonsense Israeli engineer who is project manager for the museum says, ‘the architects want the atmosphere to feel as if it was a cave when you enter the museum. Don’t ask me why’. The effect is better than the description – passing from the direct glare of the Middle Eastern sun, you experience a moment of cooling before passing out into the heat again. The sun is now mediated by the Cor-Ten bands in a sensual way, like brown skin against a Mediterranean sky. The steel is the most important part of the project of course. It was cut and assembled by Marzorati-Ronchetti, a family-run company of metalworkers based near Como in Italy, who Arad has worked with almost continually since he first created a range of bar counters for the Italian market with them in the early Nineties. The plans for the structure were drawn up in London by the director of Ron Arad Architects, Asa Bruno, who is also a native of Tel Aviv. The real challenge, though, has been arresting the oxydisation of the Cor-Ten at just the right colour. ‘The Hot Wire technique, in which a wire made of solid metal is fed at high temperature and high velocity through a heated nozzle on to the surface was ineffective, as Cor-Ten rejects surplus metal applied to it,’ says Bruno. The practice then approached the gloriously named Milan Polytechnic Institute of Oil and Grease, specialist in developing steadfast colour systems for the car industry, which created an oil that could impregnate the metal. Due to time constraints, a small section had to be erected untreated and now Govrin is trying to replicate the treatment system in situ. The aesthetics of the building are as much a challenge as the techniques. Holon’s administrators no doubt expected the same clearly legible sense of luxury that Ron Arad has conferred on the foyer of the Opera House in Tel Aviv. Instead, when they approached him in 2003, he suggested they invite Daniel Charny, then a lecturer at the RCA, to ensure that there was a clear brief for the building. During three months of research, Charny was repeatedly recommended to reflect local interests and design activity. Zahava Doering, head of museum planning at the Smithsonian, told him: ‘the more unique and adapted to the place, the better chances are that the museum will develop significance’. It is still early days, but the Design Museum should manage both its local and global ambition. The final design of the building appears to valorise the visiting exhibitions rather than domestic ones. A huge holding bay for storing incoming works sits in the basement. Of particular note, though, is the way that the delivery area is open to the public so people can see the arrival and unwrapping of treasured objects from around the world. It is a fascinating proposition for a metropolitan area, which prides itself on the way it converses with Europe and America. Charny concluded an article on his research published in Blueprint in December 2004 that the museum should be ‘a dynamic inspirational hub of contemporary history’. The director of the new museum, Galit Gaon, has hitherto been director of the fascinating Cartoons and Comics Museum, which is nearby. The museum has developed a reputation in theMiddle East for promoting critical voices. She’s not the obvious choice for a Design Museum but certainly one that proves that Charny’s research is still informing the project five years later. Given that Tel Aviv has continually defined itself in opposition to places where Jews are persecuted or persecute, its neighbouring town of Holon provides an interesting proposition: it’s actually quite like other places. Here we have an array of high-rise developments into which culture is being added at a later date, along with public transport. If you must compare the Design Museum to a Guggenheim, and the difference in scale and budget is really stretching things, then it should be compared to the one in Abu Dhabi, as yet unbuilt. 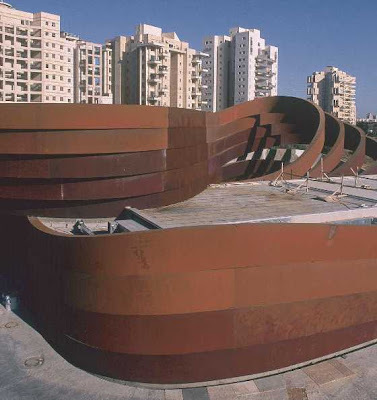 Holon of course, is unlike a Gulf State in many ways; its expansion is due to immigration rather than oil wealth, but it is a desert region – the name Holon is derived from the Hebrew word for sand – that is covering itself with high-rise blocks of luxury apartments. Develop first then add the culture later: this is a typical approach in the Gulf States. Given the considered way that he has addressed Charny’s reappraisal of European museums, Ron Arad could just have created the model for a new kind of Middle Eastern museum.